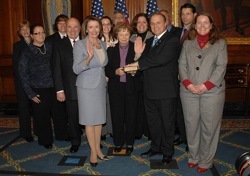 NY’s Massa Sworn In and Co-Sponsors HR 676 – Healthcare-NOW! Within less than a week of being sworn in as the new Congressman from New York’s 29th Congressional District, Eric Massa proudly informed Rep. John Conyers that he will co-sponsor HR676. Massa also proclaimed his intent to be active in his support of the bill to provide publicly funded, privately delivered healthcare to every Amercian. Many of CNA/NNOC’s tireless RNs will remember visiting Massa’s district during the election season with the bus tour that brought the RNs report card on candidates’ healthcare reform plans to the battleground states and districts. In addition to being a staunch supporter of healthcare reform, Massa is a cancer survivor and a 24-year veteran of the U.S. Navy. He defeated a Republican incumbent to take the Congressional seat and wasted no time diving into the work that needs to be done in Washington. Like many candidates from this cycle, Massa took on tough issues and fought hard — and still has bills to pay from the campaign. Any individuals who may wish to congratulate Rep. Massa on his co-sponsorship or help him in any way can visit his campaign site link above. Massa made a special point during his swearing-in reception to thank the nurses who traveled to his district to talk to voters about healthcare and those activists on the ground in his district who stood by him even when the going got tough. Welcome to Washington, Rep. Massa.